Homelessness is a persistent and national problem. It is also often linked to substance abuse. One does not need to look hard to see the connections between homelessness and addiction to drugs or alcohol. Not everyone who is homeless has a substance abuse problem, of course. But it is clear that treatment for addiction is an important part of ending homelessness. Problems such as job loss, evictions, and loss of income can all contribute to homelessness. Addictions is a possible link to these problems. It is difficult to determine which came first for people: homelessness or addiction. In fact, it is very similar to the old chicken-or-the-egg debate. There are people who cope with homelessness by using drugs or alcohol. On the flip side, there are also people who become homeless because of their substance abuse. Whichever the case, it is always true that addiction always carries the possibility of the downward spiral that leads to homelessness. 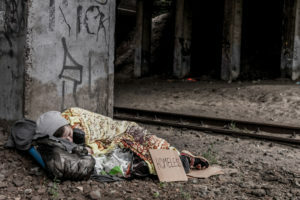 According to a survey by the United States Conference of Mayors, 68% of cities reported substance abuse as the most prominent cause of homelessness for single adults. Another study surveyed homeless people, and 25% of them said that drug use was the main reason for being homeless. In 2013, drug overdoses surpassed HIV and homicide as the leading cause of death among homeless adults in Boston. Opioid painkillers accounted for 8 out of every 10 overdoses. Addicts often lose their jobs. Many times they are unable to perform their duties due to intoxication. They may be late to work quite a bit. Or they may take off work often, and they may not give an excuse. Eventually, they become in a position where they seem unreliable, so they may get fired. Addiction and losing a job will drive them farther toward rock bottom. An addict often cannot get another job if they have been arrested and fired. Many times they will end up homeless because they were arrested and out of work. The homeless population is often found on the street because they lost everything. Getting high may be the only thing they have to “look forward to.” They will continue to search for their high at the detriment of everything else. The vicious cycle of homelessness and addiction will continue until the addict gets clean. There are many instances in which a homeless addict will get clean because they simply cannot find the substance they need. They will go through withdrawal on the street, and they are clean going forward. There are many people who are searching for new jobs and places to live that they can afford, but they cannot get jobs because of their past addiction. They will be in a position where they cannot get out of their situation, and they will be turned away from many jobs because they are homeless and without money. It is important to understand how strong the grip of addiction is. It is very easy to judge when you have not walked in someone else’s shoes. You will find that many addicts will not have any way of controlling their urges, and they may do anything to get their next high. What they need is someone who understands they have trouble controlling their urges. There is no person who is exempt from addiction. Addictions have the power become quite a large part of someone’s life even if they seem benign. Homeless addicts need someone to support them in the best way possible. They do not need judgement. The lifestyle that they are living is not sustainable, and they are unable to keep a job or stay in their home. Helping someone find a job is quite important as you will help them get back on their feet. The support that you give may be the one thing they need to get past homelessness. Addicts do not want to be homeless. Unfortunately, an addict’s unintended consequences are tied to homelessness. Ensure that you are ready to help your support your loved one even when you do not agree with all that they do. New England Recovery & Wellness Center is a preferred provider of clinical and holistic addiction and mental health rehabilitation services located in the heart of New England. Created by a team of experienced addictions professionals, our program offers a curriculum rooted in evidence-based practices. Our team has developed actionable strategies that can be utilized throughout your road to recovery. We believe that sustainability is possible when an individual can successfully shift their internal perceptions and beliefs to a new practice consistent with healthy behaviors and peer support. Our commitment is to helping individuals learn how to live an alcohol-and-drug-free life while creating new possibilities for a positive future.